15 minute max exposure time. 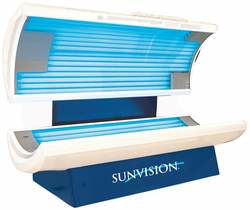 98% UVA rays, which means you only have a 2% chance of burning. 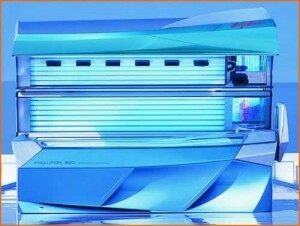 Equal to 5 times tanning in our Gold Bed in just 1 session. 12 Minute max exposure time. 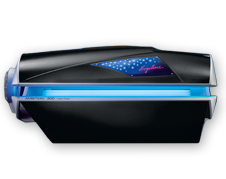 160 Watt Bronzing bulbs, 3 High Pressure Facials, shoulder and neck tanners totaling 11,000 watts. 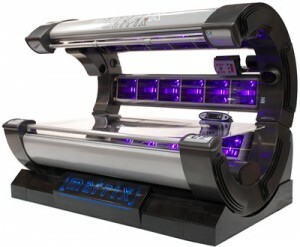 Voice control to talk you through your tanning session. Full body fans and separate facial fans as well. 160 watt bronzing bulbs on top shield and 120 watt bronzing bulbs on the bottom totaling 7,100 watts. 3 High pressure facial bulbs. Radio with iPod hook up included. 20 minute max exposure time.